The Last Unicorn: Deluxe Edition by Peter S. Beagle. In a fairy tale, nothing is without consequence. The unicorn, supposed to be the last, steps out of her forest, and it begins to die, she begins to fear, and she becomes the heroine. There is a point in the novel where the unicorn is turned into a human so as to escape detection from the being that would destroy her. They have no other choice, Schmendrick the Magician argues, as she becomes upset, knowing she may never become a unicorn again, that she may die in a prison. However, she knows as well as he, that one must continue the quest, because if she doesn't, no one else will. This self-awareness is present in the entire novel, making fun of itself, of the form of the fairy tale and the fantasy novels that came before and have come since. At the same time, as many young people do, Peter S. Beagle interwove fantastic ideas about immortality and life which aren't exactly trite. The work teeters on the edge between fairy tale and parody, and Peter Beagle talks in the introduction about his own acceptance that what he had written was actually alright. I found that those glimpses behind the story were what made this ebook even more appealing. The balance of good and neutrality, instead of good and evil, is a much more interesting one. There is a conversation near the end of the novel between a wizard and a unicorn where he says he isn't sure if he'll continue to do good or if he'll simply be neutral, an extremely nuanced reflection, something which Diana Wynne Jones also commented on in The Darklord of Derkholm, just as briefly as Beagle does here. The wizard in The Last Unicorn though is the kind I like best, having a wary oversight of the world and mortality - knowing that good vs. neutrality isn't really what the storytellers chop it up to be. I must tell you that while The Last Unicorn is one of my favorite books, it isn't flawless, and knowing that Beagle went on to write Tamsin, another favorite book of mine, sets it as a marker of growth for him. But I hasten to add that the flaws found here are valuable to me, they are points around which we may compare the prose, which is lilac if any color should be ascribed to it, the characters, who aren't quite their archetypes, and plot, which is gripping if occasionally meandering. It's unusual and even while Schmendrick forces us through the ropes of the fairy tale, everyone knows that they live in such a world. They know the rules, even as they try to fight against it, even as they allow themselves to be pulled along by the course of it. It's a strange world that is as reliant upon participation as our own. If you don't participate, things just won't happen, a consequence seldom highlighted as it should be. At times hilarious and bone-crawling, it is actually a bittersweet beautiful novel, much like it's protagonist. While the unicorn undergoes the most growth of all the characters, transforming from apathetic to heartbroken, I don't think we were privy to all of it. 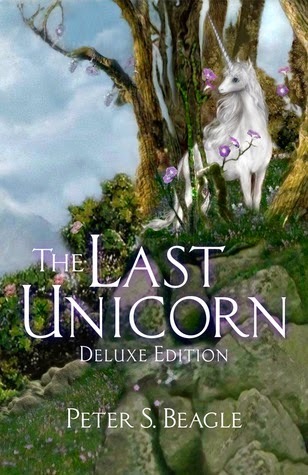 We know that while her time as a human showed her new things, I believe there was something already inside her which made her different from all the other unicorns, that made her leave the forest in the first place, and that had any other unicorn gone on the quest instead of her, the end result would not have been so heart wrenching. After all, not just anyone can star in a fairy tale. For years fans of The Last Unicorn asked for a sequel, and Beagle vowed to never return to the tale. A casual promise made by his agent, however, pulled a story out of the fairy tale land 40 years later, promising us a future story with the kind of heroine YA fantasy aspires to. That Beagle could find her wandering around King Lír's kingdom, at ease among wizards and unicorns, kings and griffons, makes me very glad. Two Hearts offers no promises, but in Sooz there is a great deal of potential. An adventure is lurking on her horizon. I will, however, only whisper of my anticipation. You know as well as I that this is a coda as much as a harbinger, but lets not jinx anything. Prophecy's have a way of being fulfilled, one way or another. You can read Two Hearts on the author's website. 236pp. Conlan Press. 1st July 2013.